G4K Lovely Puss Escape is another point & click escape game developed by Games4King. In this game, a lovely pussycat was living very happily in a beautiful and gorgeous village. But one day, the kitty got unexpectedly stuck in a house. Your duty is to rescue the lovely pussycat. 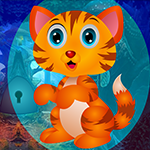 It will help you to find the hidden clues in the form of colours and numbers and to find the items where the lovely pussycat is to save the feline. Find them all and solve all puzzles to free the lovely pussycat. Good luck and have fun! Where is the 5-colour clue coming from? Or is it just guesswork? Pop! Of course: The clue is on the puzzle! Great game up until the slider at the end....good grief give up the sliders! I never finish when it's a PITA slider. At a loss as to where to use the card suit clue.